I’ve been thinking about this post for quite a long time. When I first imagined it, it was a long list filled with the important relationship advice I feel compelled to share with everyone after traveling around the world for more than a year with my husband. I apparently thought I was an expert on the subject because I spent the majority of our 396 days on the road within a 10-foot radius of him and we’re still married. Love on the rocks. 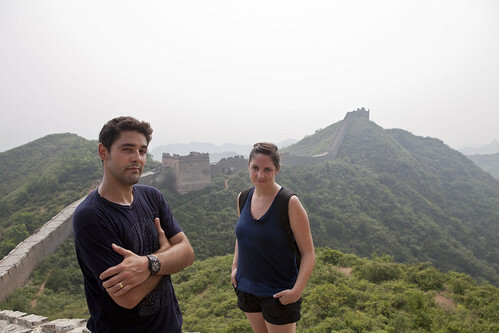 We pose on the Great Wall in China. But life has a way of showing me how little I really know. But who knows! Maybe your boyfriend has horrible road rage and could use a little driver’s ed. Relationships are very specific to the people in them. Do you remember last post where I discussed the omnipresent jackass? There really is always a jackass and sometimes it’s me. I know this shouldn’t be a relationship saving revelation but I think it might be. You’d think I would have already firmly grasped the existence of my inner jackass growing up in a family of four children. My sister’s favorite retort, “Get off your high horse,” still echos in my head. Still I had never been able to translate that tip to my marriage. What role did I play? I push too hard often at the worst of times (Oslo). My brutal honesty can do more damage than most people’s lies (Sydney). Way too often I think I know what’s bothering you (Rio) and think I have all the answers for making it better (Berlin). Too often in our closest relationships we get so hell-bent in convincing the other person we’re right, we forget to look at all the ways that we’re wrong. So that’s it. That’s my contribution to the stacks of self-help, relationship jewels out there. Sometimes I’m the jackass and sometimes it could be you.